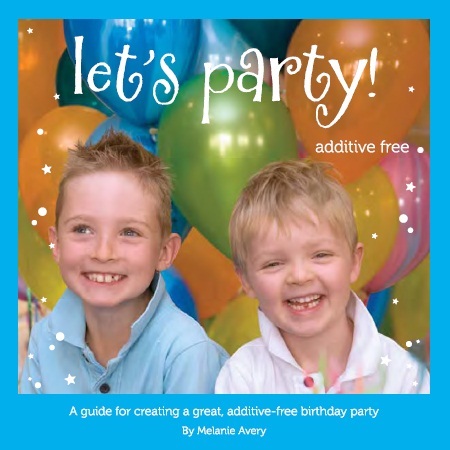 A guide to creating a great, additive-free birthday party. It is that, but it is so much more. When I started to read Let’s Party! Additive Free I had no idea I was going to gain such an education. Melanie begins the journey into the unknown world of additives by exposing some very well hidden truths. As a parent and a regular consumer, I found myself shocked and very disappointed with the standards and loop holes which allow manufactures of children’s food products (and indeed any food products), to legally add harmful and dangerous additives to foods without even a word of warning. Melanie continues to explain some of the ‘impossible to know otherwise’ labelling numbers and what they mean. Such an eye opener for me, I am now much more aware of what I buy when shopping for my family. Melanie doesn’t stop there, it is a party! Good wholesome fun and activities you may remember from your own childhood. That is what a party is really about after all, fun, friends and entertainment. This guide can help with everything from how many to invite, to what party treats and prizes to buy. The grand finale however, is the recipe section of this book, I have been itching to try some of these recipes out with my daughter and gee, your children will not be missing out on a thing! It is not a replace the cake with carrot sticks book, it is real party food. Using the right products and replacing certain ingredients you can have an amazing kid’s party. I really appreciate the amount of research Melanie has put into this book, the hours of being on hold with food companies and being transferred from desk to desk just to get a straight answer about those additive questions. A very well put together book which I highly recommend to any parent, childcare centre or caterer for children. Parents, if you have children that show obvious effects from foods, such as hyperactivity, rashes, irritability etc. This book is even more important for you. Well done Melanie Avery and thank you.